The fear, the dark woods, strange noises and the freezing cold of a night in the mountains led him to seek refuge and help desperately to catch a glimpse ... until he believes his salvation. Will he ever find his way back to our tourist lost? " Anyway here is the video! I just learned that there will be no Art on Ice in Stockholm next year. Bummer. I'm soooo sad now. bluegrace, I think no Finland either But what a good reason for a trip to Swizerland.. Thank you, Hill, for the info ! And now AOI added on their Facebook-page that Daisuke Takahashi and Joannie Rochette will be part of the show, too ! Oh, my, Daisuke and Stephane in the same show...my two favorite skaters - I definitely have to start saving up for a trip to Switzerland in February! I guess it's time to open AOI thread like we usually do? New show was added to the schedule! "Kings on Ice" in Warsaw, Poland on February 28th! Maybe some of our European fans will be able to go. I might be going to Warsaw to see the show, but I'm not 100% sure yet I found only one short info in English about this show, the rest is all in Polish. And they say Stephane, Plushenko and Slutskaya, but I can't find the whole list of skaters. I saw some info about the show before but was reluctant to post knowing it's Plushenko's show and how it was in the past but since there is confirmation from Stephane it looks much more likely (and the Olympics is long over). Still, I don't know if it's 100 % sure, we know how it ended with some shows. 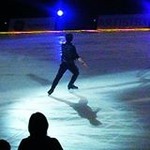 It would be the first time Stephane skates in Poland which would be great, I know he has fans there. I can help to translate the information if someone needs, I didn't see the list of skaters other than what was mentioned but I assume it will be similar to usual Edvin Marton show with some acrobats, maybe Brian Joubert or Tomas Verner if they are available. Thanks Eleanor for this information. I found out that the ticket price for this show seems to be ridiculously cheap, so maybe I'll just buy a ticket: it wouldn't be a big financial loss, if something went wrong.